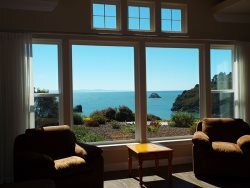 Unwind after a long drive to sample premier wines coupled with fresh ocean breezes, great company, and bar snacks. Voted Humboldt's Best Wine Maker, try wonderful wines that are made from select grapes grown in small, hillside vineyards from the Napa, Sonoma, Mendocino, and Amador appellations. Moonstone Crossing wines are made from select grapes grown in small, hillside vineyards from the Napa, Sonoma, Mendocino, and Amador appellations. Moonstone Crossing wines are hand-crafted in small quantities using traditional-style winemaking techniques. The wines are neither pumped, fined nor filtered, with only a minimum of sulfites added in the winemaking and bottling process. Specializing in hearty, full-bodied, rich-flavored red varietals, present and future offerings include Sangiovese, Barbera, Zinfandel and Old Vine Zinfandel, Cabernet franc, Syrah, Petit Sirah, Merlot, Cabernet sauvignon, Carignane, Nebbiolo, Aglianico, Pinotage, and three blends: Rhone-style, Bordeaux-style, and Super Tuscan-style blends. Zinfandel and Souzao ports along with a crisp but smooth, lightly oaked Chardonnay are also available in addition to the red varietals. 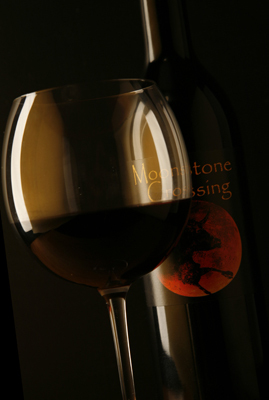 Moonstone Crossing is a winery dedicated to the proper development and aging of its wines. All red wines are aged in French and American oak for 22 to 36 months before bottling and then bottle aged an additional 6 months prior to release. Summer/Fall Hours: (June Thru Dec) Wednesday thru Sunday 12 to 6 pm or by appt. Thursday open until 7 Monday 12 to 6 pm thru Sept. Winter Hours: (Jan thru May) Wednesday 2 to 6pm Thursday 4 to 7pm Friday thru Sunday 12 to 6 pm or by appt.